One of the duties and privileges of a Liveryman is to attend the Common Hall ceremonies at Guildhall, held twice a year, to elect firstly, in June, two sheriffs, and then later in September, a new Lord Mayor, each for the coming year. These ceremonies are splendid and colourful, involving the level of pageantry that the City does so well. 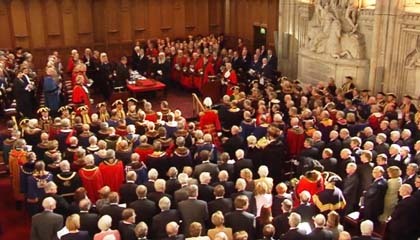 The procession of dignitaries, including Masters from all the livery companies, being led up the centre aisle of Guildhall, for the election of Lord Mayor in 2009. The election of the Lord Mayor this year takes place on Wednesday the 29th. September, with the proceedings starting at around 12.00 noon, although to get a seat in Guildhall, you would need to arrive nearer 11.00. If you are a liveryman and wish to attend, you should contact the Clerk for a ticket, as soon as possible. Members of the Feltmakers Company are invited to attend a lunch at Tallow Chandlers Hall, following the ceremony and this is always an excellent and informal affair, where you can meet fellow liverymen from not only the Tallow Chandlers, but also from other selected livery companies to whom the invitation is also extended. Attendance at the election is free of charge, but there is, of course, a charge for the lunch. Details have been sent to liverymen in a recent letter from the Clerk. All Feltmakers are encouraged to attend this spectacular event.